The Trump Administration has been engaged in trade war with China and other key allies including Canada and Europe. Earlier this month, there was a high level meeting between the U.S. and China over trade and intellectual property issue. The first round meeting produces no consensus, and US Secretary Mnuchin said that the trade issue is “on hold”. However, on Tuesday, President Trump said he would go ahead and impose 25% tariffs on $50 billion of Chinese import and restrict investment in the American high-tech industry. China threatened to retaliate. Just today the U.S. will also go ahead and impose tariffs on steel and aluminum imports from Canada, Mexico, and European Union. They have previously been exempted and the enactment got delayed for 1 month. Condemnation from U.S allies immediately poured in and the EU threatens to introduce countermeasure. The exemptions for Canada and Mexico end because NAFTA talks took longer than expected. Italy, the Euro zone’s third largest economy is in the midst of ongoing power struggle. Italy has been without a government since early March after inconclusive vote. The election saw two populist and euroskeptic parties perform well – the Five Star Movement (M5S) and the far-right wing Lega. Both these parties want to leave the Euro zone and if they form a coalition, or if one party wins outright, there will be a fear of potential European Union breakup. The prospect of new election have rattled investors as Italy might effectively vote to leave the Euro. Italian bonds suffered their worst day since 1992, with two year bond price falling and yields surging to 2.73%. Italy’s FTSE MIB Index is down 12% on the year. Spain, on the other hand, faces a no-confidence vote for Prime Minister Mariano Rajoy this Friday. Last week, a former treasurer and close friend of the president was convicted of money laundering and fraud. The country’s ruling party has also been involved in an illegal kickback scheme. The recent report suggests that Basque political party would back a no-confidence vote, which if true, would guarantee the Rajoy’s downfall. Rajoy’s departure could trigger second political crisis in southern Europe. Spain’s Index $IBEX has reacted negatively with the looming vote and could continue to be under pressure if there’s uncertainty as a result of the vote. Those factors above may provide temporary headwind to the stock market, especially the peripheral European countries. $IBEX is close to breaking below 3.23.2018 low (9327.6). A break below should open up more downside in the Index. 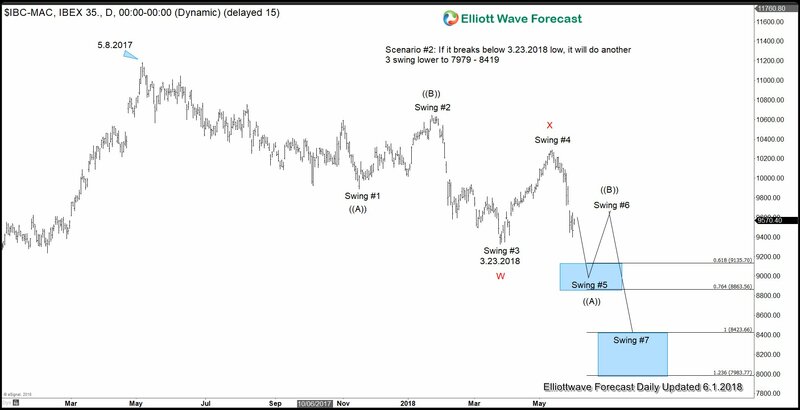 There are two scenario that can play out assuming the Index can break below 3.23.2018. The first scenario above is the more bullish scenario where the Index just continues lower to 8682 – 8990 to finish the seventh swing. 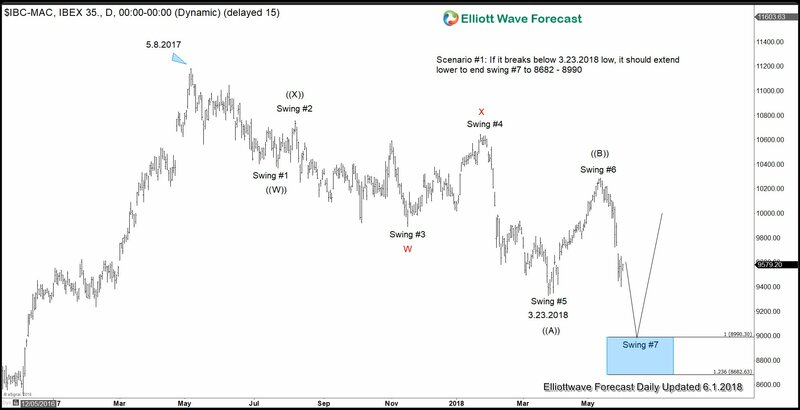 Recall that 7 swing is a WXY or commonly called double correction Elliott Wave structure. 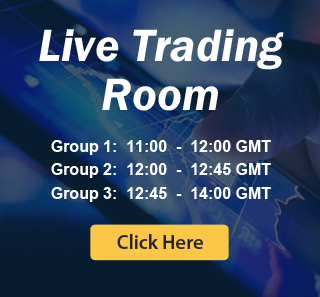 If you enjoy this anslysis, welcome to check our work and join Free 14 days Trial to get access to Elliott Wave Forecast for 78 instrument, Live Trading Room, Live Session, and more.